Not much in this life is static. Just like we grow and age, so do the plants and landscapes that surround us. You may have noticed that we have a large population of big shade trees in the Dallas/Fort Worth area. We need these trees to shade our homes and cool our urban environment. And while they might be big now, they all started out as young saplings when planted years ago. And when they were planted, most were surrounded by lush green lawns. Decades later these same trees may be anywhere from 40-60 feet tall and wide, casting a great deal more shade than they did when planted. And while that’s exactly the reason they were planted in the first place, all that shade is making it tough for your lawn to survive. 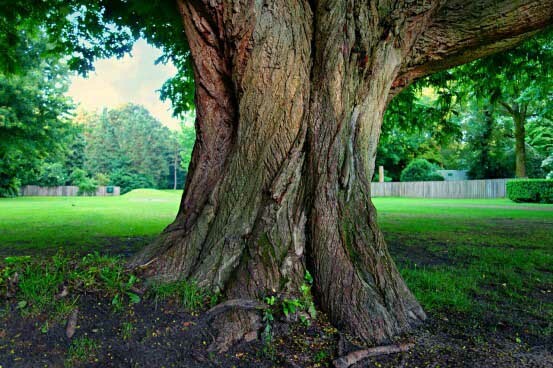 Once a small tree grows to a mature size it will easily outcompete your lawn for sunlight and water. While you may think you can simply prune the tree to let in enough light, you’ll typically do more damage to the tree than you will help the grass. Grass will more than likely never again grow lush and green under your large shade tree. Why not? Sun: Grass is a sun-loving plant. Even Zoysia and St. Augustine, the more shade tolerant of the bunch, need a solid 4-6 hours of direct sun to grow strong. Water: Trees take up a lot of water! And despite what you might think, most don’t have a large taproot that gathers water from deep into the soil, their roots are typically shallow and widespread. It’s tough for grass roots to compete with dense tree roots under the canopy. Know that each yard, and shade tree, is different. Some may have canopies that are high enough to let in enough light for the lawn beneath – this may also depend on where they are planted in relation to where the sun passes by. Just because your neighbor may have some grass under their tree, it may not be possible in your yard. Overtime, as your lawn declines in shade, you’ll need to consider replacing it with more shade-tolerant groundcovers. No amount of extra water or fertilizer will make grass grow well in the shade! Whichever you choose, grass or tree, both will need healthy soil to thrive. Whether you sign up for our organic Soil Building Program, another organic soil building company or do it yourself, your soil will need to fed so that it can in turn feed your plants.